Tasty calcium for children in soft chewy nuggets for health and strong bones. Cal D chewz specially designed to provide a combination of high calcium to keep bones healthy and strong for the child's growth, vitamin D helps increase calcium absorption. Calcium for children Cal D chewz helps ensure an adequate calcium intake during childhood and helps reduce the risk of fractures and osteoporosis later in life. Cal D chewz prepared from calcium carbonate, natural milk mineral complex, which is easily absorbed by the child's body. Giving your child to take a calcium supplement has now become very easy, as it is tasty and useful to the same child will be easy to take with the Nuggets, which is suitable for children who have difficulty in swallowing large tablets. One or two of tasty Cal D chewz daily will allow children to meet the requirements of calcium in the body. 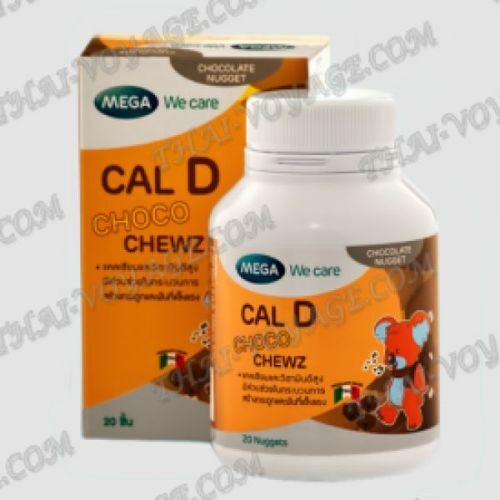 Cal D chocolate nuggets only contains 20 calories, compared with other sources of dietary calcium. Dairy complex minerals rich in calcium, phosphorus and magnesium, Cal D made from milk with a unique separation process. Application: Children and adults chew 1 soft Nuggets 1-2 times a day with meals. In multiples of 20 chocolate nuggets.